Girths – the good, the bad and the ugly! 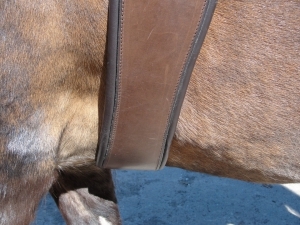 In this article we are going to look at some common girths and how their design can affect the horse. 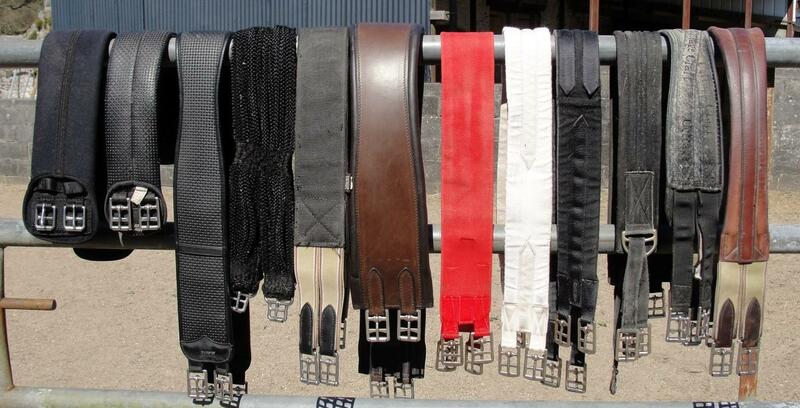 All of these girths are popular and can be found in most tackrooms up and down the country. We know that a saddle which has defects or is the wrong width can ruin his ability to perform at best and at worst could turn him into a dangerous wreck. 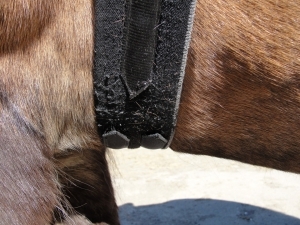 But, have you ever stopped to consider how the design and materials used can impact on your horse and his performance? 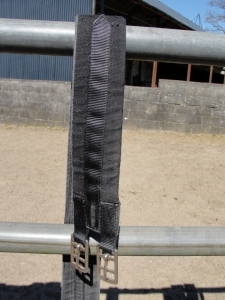 We often look at girths and simply see them as a nice colour matched, complementary strap to go with our saddle and numnah. If it feels soft to touch or has elastic, then it must be OK, right? So we will look at each girth in order and talk about the good and bad points. Wide, supportive bearing surface. Very little stretch. 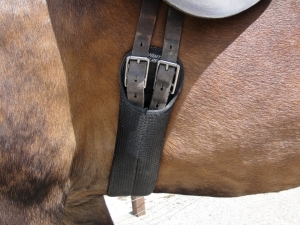 Good backing behind the buckles with generous surround to prevent elbow contact. These rarely chaff and are easy to clean. 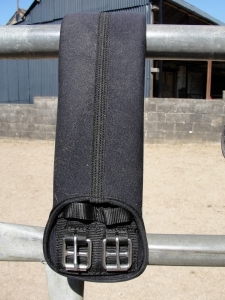 The Stubben neoprene girths offer unparalleled grip and security when used with treeless saddles. Wide supportive bearing surface, very little stretch. 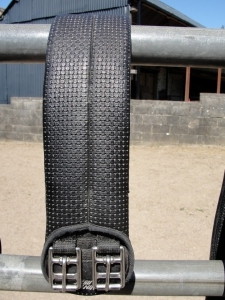 Good backing behind buckles with adequate surround for the elbows. Easy to clean and rarely chaff. A shaped long girth with a broad bearing surface. Very little stretch. Smoothly bound sides to protect the skin. Roller buckles for smooth girthing. Easy to clean and rarely rubs. A long girth made from thick, soft nylon cords which all run parallel forming a self shaping broad bearing surface. These girths are fantastic and they always fit to form perfectly as each cord has its own tension. 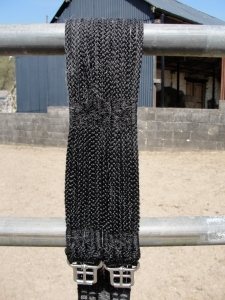 They offer excellent grip on rounder body types and rarely chaff because the horses body stays much drier because of better airflow through the cords. Very little stretch. Smoothly bound sides to protect skin. Roller buckles for smooth girthing. The string girths do need to be washed carefully in luke warm water but always come up like new. 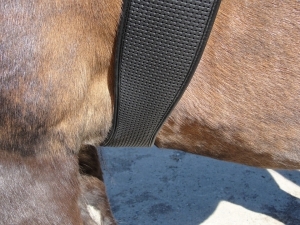 A long girth with a removable neoprene backing. This has a wide bearing surface and elastic inserts on both sides. 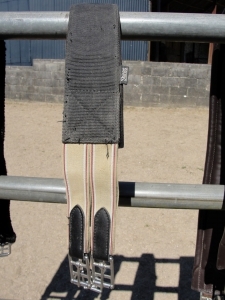 The elastic is only double thickness so may prove to be too stretchy and irritate some horses by allowing excessive saddle movement. 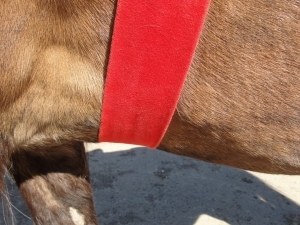 The girth edges are not finished which could also aggravate a horse with sensitive skin. 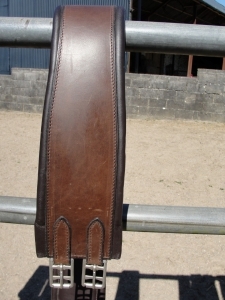 A long shaped girth with wide, super soft leather lined padding and space for elbows. The outer shell being stiff, gives a wide supportive area with no stretch. A girth like this will last for decades if cared for appropriately. 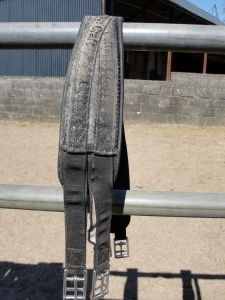 An old girth popular in the 1970’s which today, still has plenty of life left. 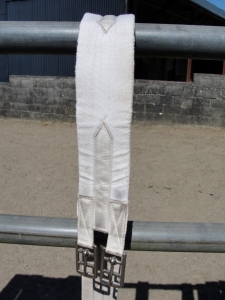 A single wide cotton band which takes the horses shape well With no stretch and good bearing surface this is another comfortable, horse friendly girth. These are best hand washed in warm water and scrubbed with a nailbrush. The girth shown does not have the modern roller buckles but they could easily be changed by a saddler. Now we’ll look at some of the worst offenders for horse comfort. You can see from the inset picture that even when draped across the gate these girths cannot distribute pressure equally across their width. 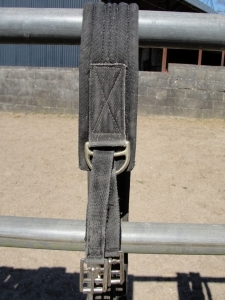 Factors that cause this include parallel stitched lines, padded center panels and central buckles as commonly fitted on humane girths. These have always been a popular girth, and indeed, still are. Possibly because they are a cheaper girth which feels soft to touch and are available in a variety of colours. However, this style of girth collapse in the middle and where the pressure is greatest at the bottom of the ribcage, only offer a very narrow area of support. 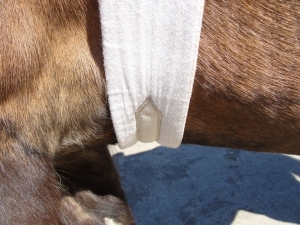 An attempt has been made to keep the girth shape by the addition of two outer nylon tapes, however, as you can see, it still fails to give a constant bearing surface. And in fact, would have been better off without the tapes. 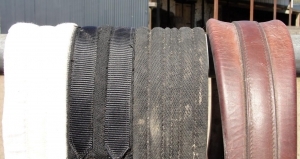 Whist these are old girths, there are many still on the market today with the same design and material. A long girth made from a tough, long lasting nylon. 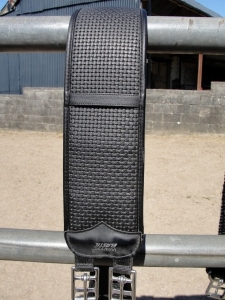 The material used on this girth is also used on other girth designs. This material is it’s biggest problem. Because of the parallel stitching along its length, it causes the girth to completely collapse when tight. Another point worth making with the humane style girths is that the buckles on each end are joined by a single nylon strap. If the stitching were to fail, there would be no fixed buckle on that side of the girth. Not a good situation to be in! 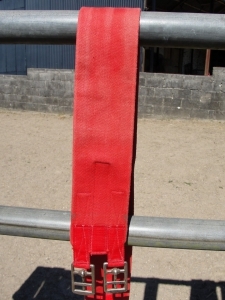 A long, shaped girth made from anti-chaff material, well bound edges and a good bearing surface. What lets this girth down is the single sided elastic inserts. This girth style ranks amongst the highest of girthing sins. So with this girth, the elastic is only double thickness giving a lot of stretch and very little resistance to saddle movement. 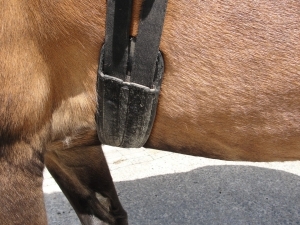 This causes the saddle to tip away from the elastic insert end. 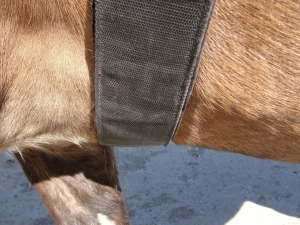 As this only happens on one side, the resultant movement will make the horse very sore in his withers and often atrophy can be seen on the opposite side to that of the elastic insert. So why not just change the girth around from time to time? Well, that would make your horse sore on both sides…. – Choose the material most suitable for the job it has to do. 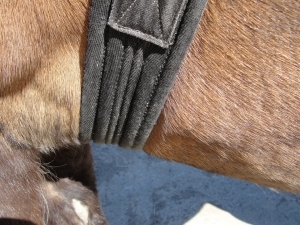 For example, a treeless saddle will be far more stable when used with a neoprene girth. – Use the longest girth possible. 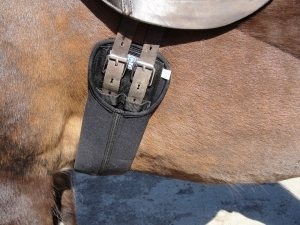 This will keep the buckles and buckle surround up away from the elbows when they move. 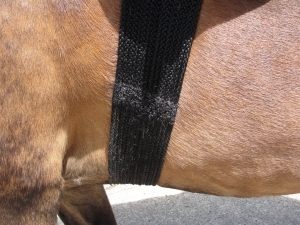 Also, it will minimise the area of skin or hair which could get trapped between the girth straps. The girth shown here is too short. 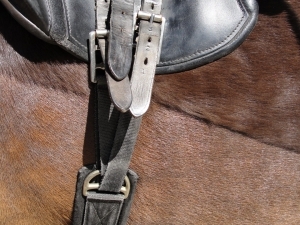 – When checking the tension of the girth mounted, it is commonplace to lean forward and slip a hand under the girth just below the saddle flap. But, when you lean forwards, all of the weight goes into the front of the saddle which pushes down into the muscles either side of the wither making the girth appear slacker than when you are sitting upright in the middle of the saddle. 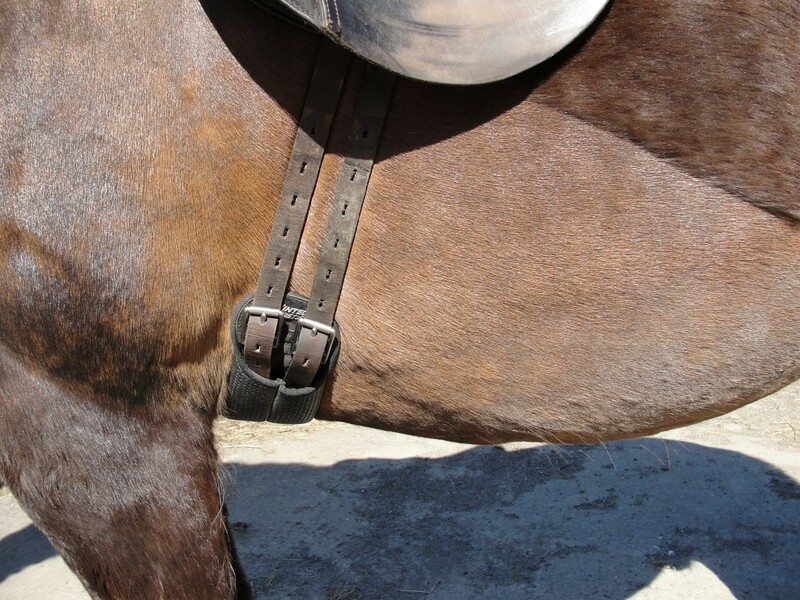 It is better to lift a leg forward and feel how much slack there is on the girth buckle. Also, the tightest point of the girth is where we can’t check when mounted. This is underneath on the horse’s sternum. In an ideal world, someone on the ground would check the girth so they could feel down the sides and around the bottom.